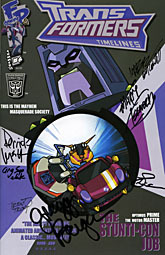 BotCon 2011 was last weekend, and this year's theme was all about Transformers: Animated. The figures, the comic, the guests, the cosplayers... it was heavy with Animated presence. And as a huge fan of Animated, I hated missing out. 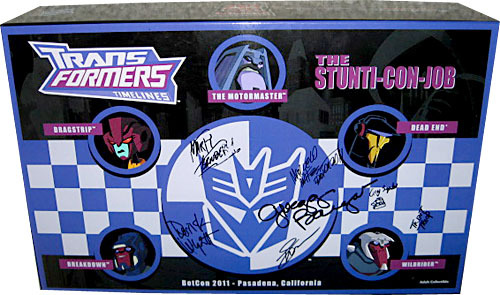 But thanks to the OAFEnet street team, I managed to get one of the Stunticon box sets. Let's take a look! The box itself is huge - a foot tall, 5" thick and 19" across. It's super-stiff cardboard, just like the Punch/Counterpunch box, with the same foam inside. 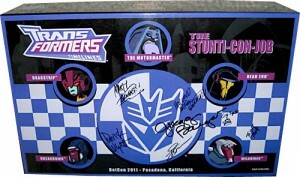 There are spaces cut out for each of the five 'bots, plus a commemorative BotCon pin with the year and date. 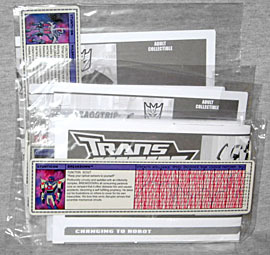 And under the foam you'll find all the instructions and bios for the characters - in the form of classic G1 Tech Specs! Now that's unexpected! I was lucky enough to get my box signed by a ton of people - Derrick Wyatt, Marty Isenberg, Pete Sinclair, Trent Troop, Greg Sepelak, Gregg Berger and Marcelo Matere. If you buy a set, you also get a certificate of authenticity and a free comic featuring the characters. Well, if you buy a boxed set - the figures are also available bagged (for people who don't care about the packaging) and if you buy them that way, you don't get the certificate or comic. The certificate lists what figures are included, when the convention was held, and the edition size of the exclusives (1,600). It's a little weird that each set of instructions and Tech Specs are bagged separately, but I guess that's handy for people looking to break up the set and sell off the parts. The heathens. The comic is officially Transformers Timelines #6, but most people will be referring to it by its title: "The Stunti-Con Job." It's set shortly after the end of TFA Season 3, with Prime and his crew heroes, and the Decepticons under arrest. The story was written by Marty Isenberg, but he worked closely with Derrick J. Wyatt and Matt Youngberg to make sure the story stayed in line with their plans for Season 4, just in case that ever gets made in some form. (Come on, IDW, make it happen!) The title is a reference to The Italian Job - and the cover even homages the movie poster! The interior art by Marcelo Matere is great, and really captures the feel of the show. When this issue gets listed in Previews in a few months, fans of Animated should definitely order it. We'll remind you. The back of the book has a con schedule, FAQ and info on the guests. It's not technically part of this set, but if you registered for the con on the first day, you got a limited Stunticon logo pin to go along with all your other swag. Again, I'm just lucky my hookup decided he didn't want to keep it (like everything else you see here). Now, as for the figures themselves... well, we'll be reviewing them over the next few days, so keep checking back, and we'll include some links to all the reviews right here. This entry was posted in blog exclusive review, BotCon, comics, Hasbro, lists and tagged BotCon 2011, Transformers. Bookmark the permalink.